Oklahoma misdemeanor cases are prosecuted in Municipal Court or State Court. The following information is a general outline of misdemeanor proceedings for most Tulsa Area Municipal Courts including Bixby, Broken Arrow, Collinsville, Claremore, Glenpool, Jenks, Owasso, Sand Springs, and Oklahoma State Courts. A pre-arrest or pre-file investigation is when police have not yet arrested you, but they want you to make a statement “to clear things up,” “close out this case,” or come down to the station and make a “voluntary statement.” This stage of the proceedings is the best time to hire an attorney to take control of your case. BEFORE speaking to the police, contact a Tulsa misdemeanor attorney to protect your rights. If there is no pre-arrest investigation, the first stage in any criminal misdemeanor case is arrest and booking. This is when you are actually taken into custody, fingerprinted, photographed, and assigned to a jail cell (if you cannot post bail) or depending upon the charges, you may be released and told when to appear in court. For some misdemeanor crimes, such as shoplifting, you may not be taken to jail. The police may simply write you a ticket and tell you to appear in court at a specific time. The first court appearance is called the Arraignment or Initial Appearance. While it is preferable that you hire a lawyer as soon as possible in the Oklahoma misdemeanor process, you can retain a Tulsa misdemeanor defense lawyer at any stage of your case whether it is during the investigation, after arrest, or the night before arraignment. This is the first time you will appear before a judge. You typically should hire an attorney before this court appearance. Under Oklahoma criminal law, if you have hired an attorney before the Initial Appearance, then you are not required to appear in court; your attorney can appear for you. At this time, the judge will tell you which charges the prosecutor has filed and ask you how you want to plea to the charges against you. After entering your plea of not guilty, the judge will tell you when you next have to appear in court. The next court appearance is called the Jury Trial Sounding Docket or in Municipal Court, the Conference Docket. Before the Jury Trial Sounding docket or Conference Docket, your attorney will make a formal request for discovery from the district attorney’s office. The discovery will include all of the law enforcement reports that pertain to your case and it may include statements that witnesses made to the police. After receiving discovery, your attorney will have a better idea about the strength or weakness of the case against you. The Jury Trial Sounding Docket, also called JTS, or the Conference Docket in municipal court, is when your Tulsa misdemeanor defense lawyer will negotiate with the prosecutor regarding your case. At this time, the court will expect you to enter a plea, set the matter for a Motion Hearing, or set the matter for Jury Trial. Many Oklahoma misdemeanor cases are resolved without a trial. If no plea agreement is reached at the JTS, then the case is set for a Discovery Hearing in anticipation of Jury Trial. The Discovery Hearing is held ten days before the Jury Trial. At this hearing, the defense and the prosecution announce whether they have exchanged discovery. The discovery must include all reports, recordings, videos, and the names and addresses of all witnesses as well as substantial summaries of their testimony. Once the Discovery Hearing is complete, the case will proceed to Jury Trial. The right to trial by jury is one of the most fundamental rights in America. You have the right to a trial by jury in a misdemeanor criminal matter. A misdemeanor jury will consist of six people and all six must agree on a verdict. A felony jury will consist of twelve people. You have the right to be represented by an attorney at trial. You have the right to hear all of the evidence against you. You have the right to cross-examine all of the witnesses who testify against you, and your guilt must be proven beyond a reasonable doubt, the highest burden in the law. Need a Tulsa Misdemeanor Defense Lawyer? 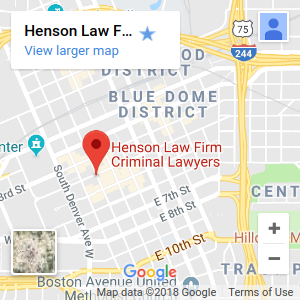 Contact the Henson Law Firm today!